Christian Atsu is part of a growing trend of Ghanaian players such as Richmond Boakye and Shadrach Eghan to not be a well-known up and coming talent in their native country before trekking to Europe to then become a household name. The twenty two year old started his career at Cheetah Academy before being successful as a trialist for FC Porto in 2009. Already known to be a country harbouring a plethora of central midfielders, until recently Ghana have struggled to produce quality wide players. In past years in hasn’t been a rare occurrence to see The Black Stars set up with four central midfielders e.g. in the 2006 World Cup or with a functional forward in a wide position à la Prince Tagoe in 2010 so his rise to prominence has certainly been welcome. Two years after joining Porto he was loaned out to Primeira Liga outfit Rio Ave where he had the chance to show he talents he display’s today, albeit in a far rawer fashion. It was evident he had incredible acceleration from a standing start, much like his Chelsea teammate Willian. He’s also a strong dribbler although he has a preference to taking a high and wide position on the right flank before receiving the ball to feet and driving directly inside in the way Arjen Robben does. He’s equally adept at stretching play on the left flank and sending in pinpoint crosses. After a swinging from dynamite to ineffectual and back in a handful of games for Porto, in 2013 he revealed he was not going to be renewing his contract with the club in May and in September Porto reached an agreement with Chelsea for his sale at £3.5 million and soon after he was loaned to the emerging Dutch club Vitesse Arnhem owned by friend of Roman Abramovich, Aleksandr Chigirinski, to join various other Chelsea loanees. Having come by plenty of attacking midfielders at once manager Peter Bosz squeezed Atsu into a central attacking midfield role he wasn’t accustomed to. Although him and Lucas Piazon often switched positions Atsu found himself in increasingly deeper areas of the pitch and he adjusted to his admirably in terms of defensive work rate. He occasionally struggled offensively as he was often asked to drop very deep and long raking passes to the flanks aren’t particularly his thing although because of the sides fluidity earlier in the season he found himself on the flank now and again and was able to execute his fearsome dribbling past fullbacks. Vitesse’s title challenge fell apart in January/February and Atsu has benefitted from Bosz’s tactical switches since them and it appears fifty year old, formerly a Vitesse midfielder himself, has realised Atsu’s adeptness from wide positions and has used them to good effect. 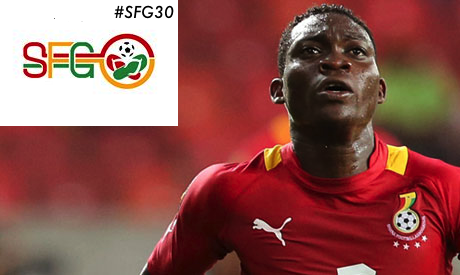 The young Ghanaian has displayed his penchant for nicely weighted through balls in attacking areas and has been finishing off chances himself . He’s almost certain to participate in this summer’s World cup and strong performance could open opportunities for the Chelsea senior team next season.